I really like Narragansett Beer, I find it pleasant to drink (when in bottles), cheap, and it’s somewhat local. I also really like supporting farmer’s markets, so, I’m going to bring you a recipe a week created with Narragansett and some local produce. Sound good? Good. 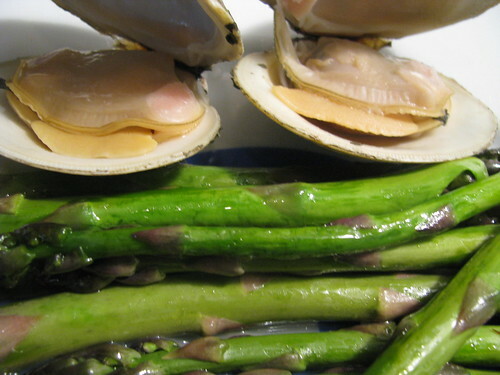 Mix Oil with thinly sliced garlic on medium heath add Asparagus. Saute on medium for about 10 minutes. Put Little Necks in Large pot, add 1/2 bottle of Narragansett + Sage let boil on high heat, cook for about 5 minutes, until they open a little bit.